Americans love to talk about food—how asparagus is best prepared, which preservatives to avoid, which types of fish are in peril, where to find the best tacos or most delectable peach pies. Most of us spend far less time contemplating the people that pick, slaughter, sort, process, and deliver the products of this 1.8 trillion dollar industry—a group of workers that makes up one-sixth of the country’s workforce. Unfortunately, the majority of these workers take home crummy wages and few benefits, according to a new report from the Food Chain Workers Alliance. Perhaps most strikingly, among workers surveyed by the FCWA, only 13.5 percent made a liveable wage (an amount FCWA defines as higher than 150 percent of the regional poverty level). And not a single agricultural worker of around the 90 surveyed said they earned enough to live on. 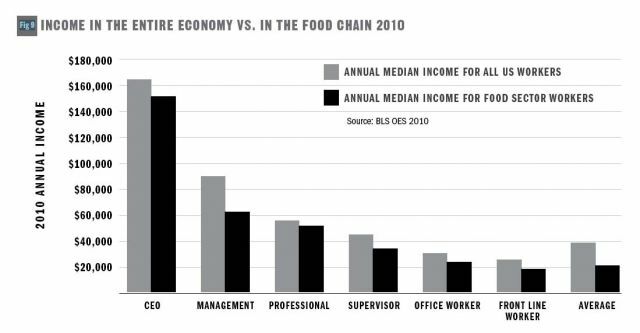 The Food Chain Workers Alliance survey results echo sobering realities about jobs across what the FCWA calls “the food chain”: a vast network of laborers in the production, processing, and distribution of food. In 2011, the lowest-paying jobs nationwide, according to the Bureau of Labor Statistics, were combined food preparers and servers and fast food cooks; restaurant servers and hosts, farmworkers, baristas, and food preparers didn’t trail far behind (and all made it in the bottom twenty). As the report points out, fair market Rent (PDF) for a two bedroom place (think: small family) is $949 a month. An employee would need to make $18.25 an hour to afford it; instead, the median wage in the industry is $9.28 for high school grads, and only slightly more for those with some college under their belts. Aside from crappy pay, most food workers surveyed by the Alliance have few or any benefits such as health care and paid sick days. More than three quarters reported having no access to health coverage through work, and over half had no health care at all. A glaring 79 percent either had no paid sick time at their jobs or did not know if they had this benefit. Yet Lo maintains a glass-half-full approach to some of the depressing stats in her report. The 13.5 percent of workers earning a living wage “is important to note because it shows that it is possible for food systems employers to pay fair wages and still do well, and make a profit.” Such employees include Featherstone Farm, an organic Minnesota farm that pays all laborers hourly and provides housing for temporary workers, Los Angeles’ Good Girl Dinette, a diner paying fair wages while serving locally sourced food, and Yale’s dining program, which offers retirement benefits for its unionized food workers and has also committed to purchasing 45 percent of food from sustainable sources by 2013.